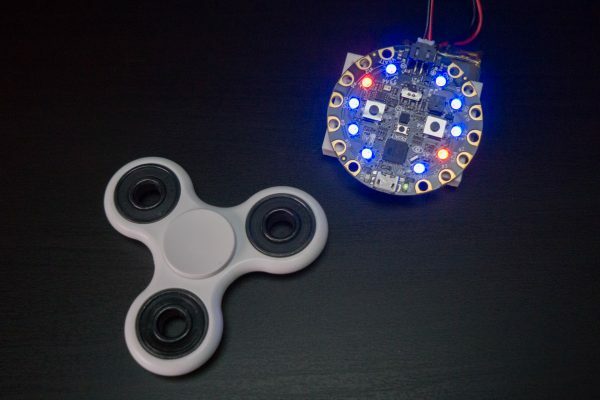 NEW GUIDE: Digital Fidget Spinner with Circuit Playground « Adafruit Industries – Makers, hackers, artists, designers and engineers! Fidgets spinners are trendy gadgets that smoothly spin around at the lightest touch. You can 3D print a fidget spinner, mill one from acrylic, or even buy one to dye with hydro-dipping to have a custom and unique fidget spinner. However what if you could have an even more unique fidget spinner, one with no moving parts? The digital fidget spinner with Circuit Playground is just that–a fun fidget spinner with no moving parts that spins NeoPixel lights when flicked or tapped! This project is built with Circuit Playground (either the classic or new express version) which is an all-in-one electronics learning board. Everything needed to build this project is built-in to the Circuit Playground board so you can get started very easily without any soldering or assembly required. An accelerometer at the center of Circuit Playground serves as the sensor to detect when the board is tapped or flicked. Once the board is flicked it moves the ring of 10 NeoPixels around the outside in a fun, colorful fidget spinner animation. The best part is since it’s only software controlling this spinner you can customize the colors, animation, and more by just changing the code! There are three ways to build this project too, either as an Arduino-based sketch that works with Circuit Playground classic and express, as a CircuitPython-based project that works just with Circuit Playground express, or as a Microsoft MakeCode project that uses Circuit Playground express. All the versions have similar behavior and are a good demonstration of what’s possible with Arduino, CircuitPython/MicroPython, and Circuit Playground boards.